Menorah in the D shines a public spotlight on Jewish unity. 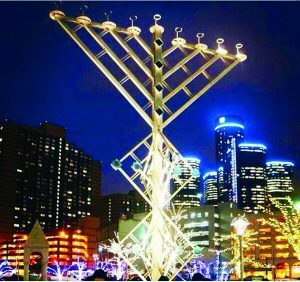 As Detroit emerges from the darkness of bankruptcy into the light of regrowth, this year’s fourth annual “Menorah in the D” celebration — starting at 5:30 p.m. Tuesday, Dec. 16, at Campus Martius — holds particular significance. Organizers of the Chanukah event see it not only as a celebration of the victory of the Maccabees, but a victory as well for the people of Detroit. 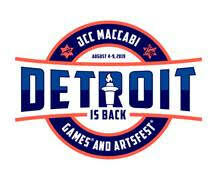 Menorah in the D is hosted annually by The Shul of West Bloomfield, Chabad in the D and in partnership with the Jewish Federation of Metropolitan Detroit’s NextGEN Detroit division, with support from Quicken Loans and other sponsors. This year, Mayor Mike Duggan will participate in the lighting ceremony along with other government officials. Everything about the event is pure Detroit, including the 26-foot menorah designed and built by artists Erik and Israel Nordin of the Detroit Design Center in Corktown and complimentary snacks provided by local businesses. For international flare, the celebration also features a live performance by the Israeli band SoulFarm. 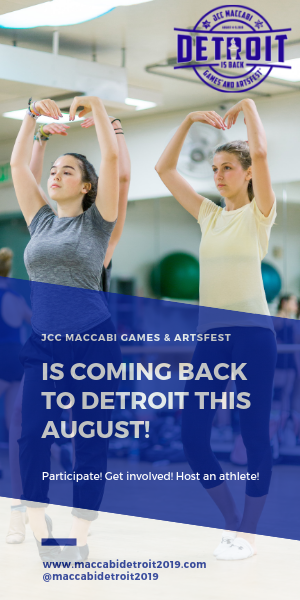 There will also be strolling jugglers and acrobats, roasting marshmallows and an opportunity to pose with the Paws, the mascot for the Detroit Tigers. Event organizers are recruiting “MacaDees” to volunteer for the event. They are needed to direct foot traffic, help with children’s arts and crafts or serve complimentary hot cider from Blake’s Orchard & Cider Mill, soup from Chef Cari Kosher Catering and other goodies from Bake Station and Whole Foods. Volunteer by signing up at www.menorahinthed.com. Sarah Snider, community outreach associate for NextGEN Detroit, said that when she was growing up here she could never picture a time when such a celebration could happen Downtown. Volunteer teams are being set up from throughout the community, including groups from Tamarack Camps, Frankel Jewish Academy and the Camp Ramah Fellows. Darien Sherman of Bloomfield Hills, a Ramah fellow, is looking forward to an evening celebrating with the entire Detroit Jewish community. Sherman added that following the lighting activities, there will be additional celebration time for the 21-and-over crowd as NEXTGen will organize some pub visits that evening around Downtown. Celebrating the miracle of Chanukah publicly is also important this year in light of the rise in anti-Semitism in Europe and the United States, said Rabbi Yisroel Pinson of Chabad of Greater Downtown Detroit. He said that after centuries of persecution in Europe, Jews forewent the Talmudic custom of lighting the menorah visibly. Only in the last 40 years, with Chabad’s leadership in holding outdoor menorah lightings, has global Jewry taken the mitzvah back out into the public. This year, in spite of the rise of European anti-Semitism, he said the public lightings will continue as a sign of Jewish pride. Pinson said the Chanukah festivities this year are also nicely timed around the first anniversary of the opening of the Chabad center in Detroit. Since it opened on Dec. 4, 2013, it has been a “nonstop” center for Jewish living and learning for the small but growing number of Jews who are moving back Downtown, he said. “We are proudly one of the fastest-growing Chabad centers in the country,” he said. For ease of transportation, there will be a round-trip bus available from The Shul, 6890 W. Maple Road, West Bloomfield, subsidized by The Shul and the Friendship Circle. Fee is $5 per person. Contact The Shul office at (248) 788-4000 to make a reservation.